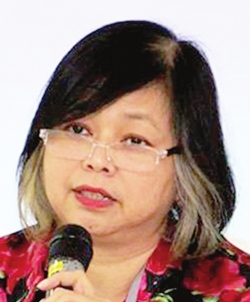 Malaysian rights activist stopped at Hanoi airport | Daily Express Online, Sabah, Malaysia. Selangor: Vietnam has refused entry to Malaysian human rights activist Debbie Stothard (pic) to attend the World Economic Forum to be held in the country next week.Stothard, who is secretary-general of Swiss-based International Federation for Human Rights, arrived at Noi Bai International Airport in Hanoi to attend the event. "Whatever inconvenience I am being subjected to is nothing compared to the attacks on Vietnam human rights defenders and the media," she said in a tweet. "I hoped that hosting the prestigious WEF would help them realise that pluralism, human rights and freedom are necessary to economic development." Meanwhile, WEF spokeswoman Fon Mathuros told Reuters that she regretted the government's decision to block Stothard. "Her invitation to the meeting stands and we will continue to facilitate her participation in the meeting," Mathuros said. Hanoi is hosting the WEF on Asean from Sept 11 to 13.